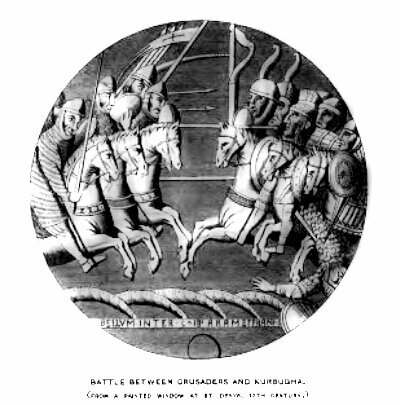 "Battle Between Crusaders and Kurbugha"
I offer here a comprehensive and illustrated presentation of the history of The Crusades, divided into easy to read posts. This post covers the Preface, Table of Contents, and Tables of Illustrations, Maps and Plans. You may read here, exactly as reading from the actual pages, the exciting story of the Crusades as documented by Dr. Stanley Lane-Poole. His book, Saladin And The Fall Of The Kingdom Of Jerusalem, was published in 1898 by G. P. Putnam’s Sons, London, and printed by The Knickerbocker Press in New York. It is in the Public Domain, being no longer under copyright protection, and is available free online in many locations, for example at archive.org. I find the online readers slow and cumbersome, but these posts are quick and clear. I’ve also digitally cleaned up the images found in this book to improve their clarity and enhance their beauty as they are fascinating historical documents, well deserving of our appreciation.